My December Luxe Box by Loose Button finally arrived in the mail today after receiving an email that they were not able to ship it out quicker/in time. Generally, I am happy with the products that I received in my box. If you are wondering, Luxe Box is a monthly subscription service in which you receive 4-5 beauty samples (Only available for Canadians at the moment). Wow! As always, can’t wait to try everything out. I’m enjoying the full size lipstick & full size eyeliner! The YVES Rocher Rouge Dragee Lipstick is a nice berry colour. It’s creamy and apparently enriched with musk rose oil. This colour is perfect for the holidays! 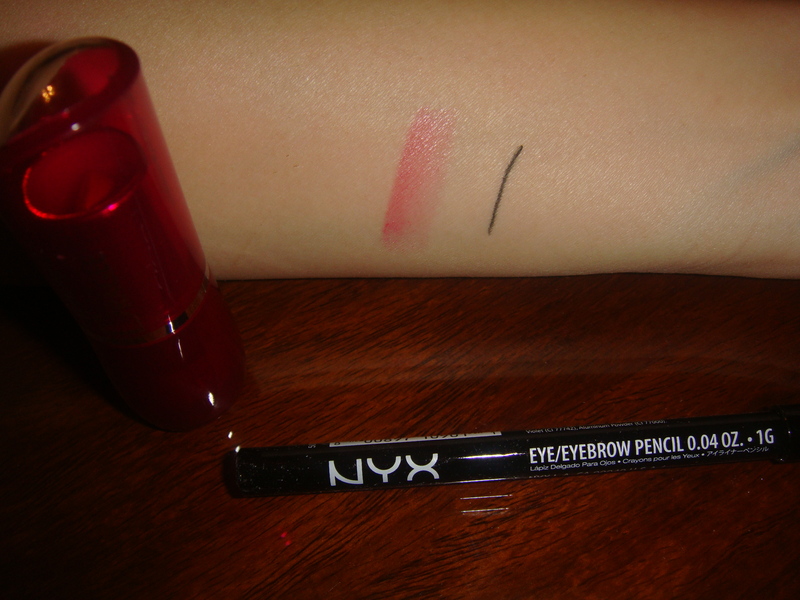 As for the NYX pencil, you can’t go wrong with a black one! Or can you? Can’t wait to see the lasting power on this. Overall, I’m pleased with my December luxe box. I watched others on youtube to find out what they received in their boxes and most of them received completely different things! It’s great that not everyone receives the same samples, making for a more customized, personalized box just for you. Side note: I’ve seen many women complain about their boxes and wanting to cancel their subscription. You obviously won’t get what you want in every box, but that’s why they provide feedback forms for you to fill out. I’m sure the Loose Button team try very hard to cater to everyone. Other wise, why don’t you just go out and purchase what you want yourself? Makes sense. 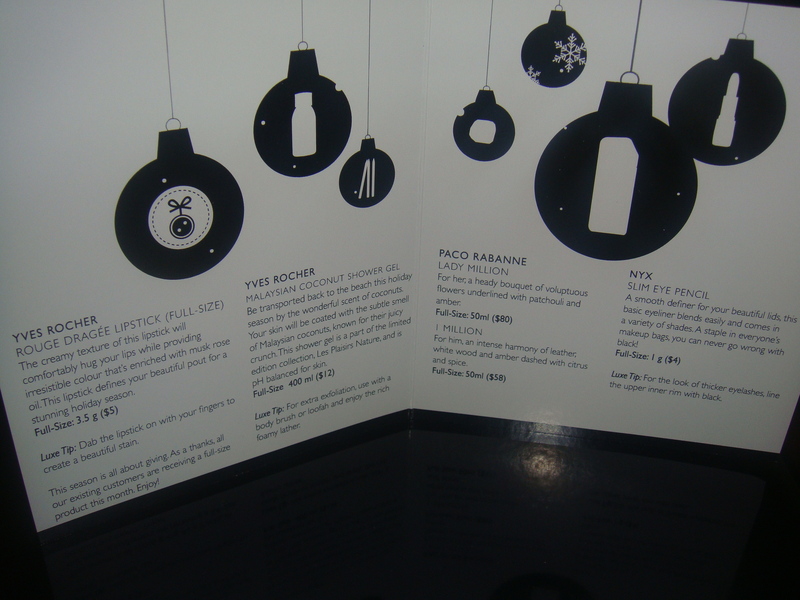 These boxes are provided to give you an idea of all the many different products that are out there to try out. Some brands you may not have even heard of! Also, if you really don’t like the products you received, why don’t you give them to someone else who may enjoy them? As to not let them go to waste. Though you are unsatisfied with this month’s box, next month may be stellar. You never know, that’s why these boxes are a “surprise.” Beggars can’t be choosers! Just my two cents. January 2012 Luxe Box « take her word. Jealous, the Birchbox I get is nothing in comparison. Love reading these though what other people get. Likewise! I was glad there was a subscription service for Canadians as I heard of the Birchbox first.